ALBANY – Louise T. Hogle Chase, M.D. passed away suddenly on January 1st, 2012 at the age of 92 surrounded by her loving family, from one of the many serious illnesses she battled most of her life. She was the wife of 54 years of the late Lloyd R. Chase and one of 12 children of the late Warren Gordon Hogle and the late Maximina Quiner Morgan. Born in the Philippines, she left Santo Tomas concentration camp and was repatriated during the 2nd World War, sailing on the S.S. Monterey in a naval convoy. Dr Chase was a graduate of Albany Medical College and the first woman fellow of Pathology at Memorial Sloane-Kettering Cancer Center in N.Y.C. 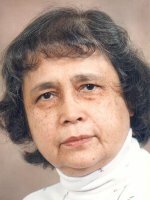 She was an emeritus fellow of the College of American Pathologists and of the American Society of Clinical Pathologists. She was also a life member of the Medical Society of N.Y.S. and of Schenectady County. Before her retirement, she was Chief of Pathology and Director of Laboratories of St. Clare’s Hospital in Schenectady. Dr. Chase loved having her family around her. She relished her role as doctor, wife and mother and later added grandmother and great-grandmother to her resume. In her retirement she maintained her medical license, enjoyed knitting, reading and crossword puzzles, along with her annual trips to Brant Lake, NY and St Augustine, FL with family and friends. She will be missed by all who knew and loved her. Louise is survived by her four children: Mary Chase Zaremski (Michael) of Altamont, Raymond F. Chase of Jacksonville, Florida, Michael P. Chase Sr. (Mary Ann) of Schenectady, and Robert P. Chase (Margaret) of Colonie, four grandchildren: Kimberly M. Chase, Michael P. Chase Jr., and Matthew R. Chase all of Schenectady and Sarah E. Zaremski of Troy, and a great grand-daughter, Madalyn C. McHugh. A sister Frances F. Purselley of Defuniak Springs, Florida, her sisters-in-law Marianne Hogle of Schenectady, and Barbara Hogle of Los Gatos, CA; as well as numerous nephews and nieces scattered throughout the country also survive her. Funeral services will be held in the Hans Funeral Home, 1088 Western Ave., Albany, Friday morning at 9:00, and from there to Christ the King Church at 10:00. Relatives and friends are invited, and may call at the funeral home Thursday from 4-8 p.m. The parish family of Christ the King Church will gather at 4:30 pm Thursday in the funeral home for a service of prayer and remembrance. All are welcome. Interment will be in St. Agnes Cemetery, Menands. To leave a message of condolence for the family, send a sympathy card, or obtain directions to the funeral home, please visit www.HansFuneralHome.com. Click here to view her grave location. Offer Condolence for the family of Louise T. Chase, M.D. Our prayers and love go out to the chase families at their time of loss. I’m so sorry to hear about the loss of your mother and your grandmother Sarah. I will be thinking about you and hope to see you Thursday. We are so sorry for your loss. You are in out thoughts & prayers! Ray – It was a shock to hear about your Mom and if I can do anything to help you through the difficult times ahead just know you can count on me. Let Sarah know also that her friends here in Florida are here for her also. I’m so sorry to hear about the loss of your mother. Such a loss leaves a large hole in one’s heart. I hope, in time, many happy memories of times you shared together will fill that space. The video of your mom is tremendous – she was clearly very proud of her family and dearly loved by all of you. My thoughts go out to you in your time of sadness. I never met Mrs Chase but admired her from all that I had heard about her from Ray over the years. The video shows me what a special person she must have been to such a wonderful family. and looking down on you all. God has a plan for us all. Our thoughts and prayers go out to you and your families. I haven’t seen Aunt Louise for a very long long time. Sad to hear her loss. our thoughts & prayers are with you. You and your entire families are in my thoughts and prayers at this time. I have many wonderful memories of your mom (and dad), especially the visits to Brant Lake, and will never forget them. I hope you find comfort in your own memories and in each other. Our hearts are with you in this time of sorrow. I will miss you Aunt Louise. Our thoughts and prayers are with you and the family on the loss of your mother, my aunt. I am the daughter of Frances Purselley. We are so sorry for your loss. Please know that our thoughts and prayers are with you. So sorry to hear that my sister Louisa has pass away. I was not to far from her place, around three hour drive. I wish I got to see her before she went to her reward. My prayers are with all you her children grand children. I can not attend the funeral since I just got home, but my daughter and myself are sending some flower. May our dear Lord Jesus comfort you all. Aunt Louise is now in peace and with Uncle Lloyd. My thoughts and condolences are with all of the family. I wish I could have come to Albany for the service at least but it was not in the cards. Miss you all! With you all at this sorrowful time. You all at this sorrowful time. I wish to express my deepest sympathy in your loss. I have many memories of Dr. Chase. As a new medical technologist at St. Clare’s Hospital (in the 60’s), I was in awe of her knowledge and ability to manage. I am so grateful for the video. I will always remember Dr. Chase. Our thoughts and prayers are with you all during this very difficult time. What a beautiful video tribute to your loving mom! Keep solace in knowing she is now in heaven with your dad. Our love to you all. I am so sorry for the loss of your dearly loved one. I didn’t know her personally, she was my grandmothers sister and they look so much alike. I wish I could have known her and her family. My thoughts and prayers are with you. What an amazing women …. I know you were very proud of her. I am sure that meant so much to her. one- word description for her–“brilliant!” I am so grateful for the beautiful photographs you have shared of her role as loving mother and family matriarch. She is an inspiration, and you are all blessed with her wonderful legacy. May Aunt Louise forever warm your memories and your hearts. I know she was always one of Dad’s favorite siblings, and I still fondly remember some of the times we saw her prior to our moving to California. Our deepest sympathy to you, Bob and Peggy, and your family on the loss of your dear mother. Take comfort in knowing that she was such a wonderful woman and she touched so many people.